All the fashionistas know what we are talking about when it comes to travel in style. Who doesn’t want a piece of LV luggage to carry on in their travels? In the 1830s, a provincial young Frenchman named Louis Vuitton traveled — on foot — from his hometown to Paris, more than 400 km away. One of the odd jobs he struck up in Paris was as an apprentice layetier, a kind of manservant who would pack trunks for well-to-do travelers. 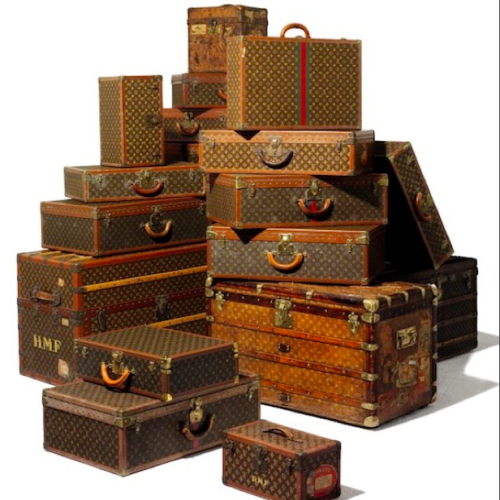 Vuitton must have really known how to pack a trunk, because he soon caught the attention of Napoleon III, who hired him to be layetier to his wife, Empress Eugénie. His tenure and skill in this field gave Vuitton considerable expertise in travelers’ needs. In 1854 he opened his own trunk-making firm in Paris. His first trunks were lightweight and airtight, with flat tops to facilitate stacking. They were wooden frames covered in gray “Trianon” canvas. Louis Vuitton trunks were soon very popular and, like today, oft-copied. The company had to keep changing its signature pattern due to copycats. The trademark brown and beige stripes debuted in 1876; twenty years later, the “Monogram” pattern was unveiled, with that familiar “LV” monogram plus four-lobed flowers ‘borrowed’ from the Japanese visual culture that was so fashionable in the late-19th century. By 1913, the Louis Vuitton store on the Champs-Elysées in Paris was the largest travel-goods store in the world.